Entering the awards is free and applications are being sought across nine categories including two new awards for 2019: Coasts and Waters, Conservation Science, Community Initiative, Food and Farming, Innovation, Political Advocate of the Year, SNH Business, RSPB Species Champion and Youth and Education. Food has a big environmental footprint but some individuals, businesses and organisations are working hard to reduce this. Our Food and Farming Award celebrates our sustainable food champions from wildlife-friendly farmers and farm shops, cafés and caterers, this award celebrates our sustainable food champions. Winning in 2018, farmer John Dalziel from East Ayrshire has integrated wildlife conservation into his successful farming system - working with partners to restore peatlands, create wetlands and conserve curlews. If you are operating your farm with nature in mind or are part of a sustainable food business apply today. New this year and ahead of the Year of Coasts and Waters 2020, we will be celebrating the contribution of those who support nature living in Scottish marine and freshwater habitats. We are also launching a new category that will recognise and celebrate an individual or group of scientists whose research supports nature conservation in Scotland. The Nature of Scotland Awards shortlist will be unveiled at a Parliamentary Reception in September and the winners will be announced at a prestigious Presentation Dinner on the 4 December at the Sheraton Grand Hotel in Edinburgh. Successfully shortlisted entries will receive two complimentary tickets to the dinner hosted by award winning wildlife cameraman and TV presenter Gordon Buchanan and BBC Scotland’s wildlife expert Euan McIlwraith. Let's celebrate the people, organisations and businesses going above and beyond to support our precious natural heritage. Nominate a person, project or business dedicated to supporting our environment or submit your own project and tell us what you’re doing to support nature! 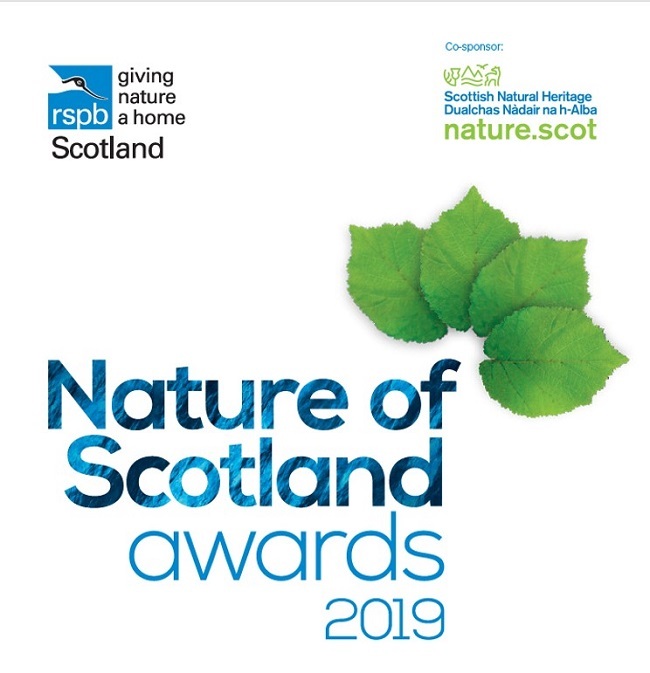 Find out more about the awards and submit your application by 4 June 2019 by visiting rspb.org.uk/natureofscotland.